Slater proposed some set of empirical rules to calculate the screening constant (σ) of various electrons present in different orbitals of an atom or an ion. Once we get the value of screening constant it is easy enough to find the effective nuclear charge (Z⋆). The Valence electron in a multi - electron atom is attracted by the nucleus and repelled by the electrons of inner-shells. 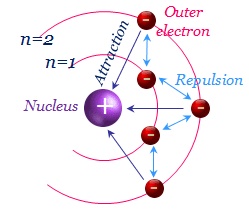 The combined effect of this attractive and repulsive force acting on the valence electron is that the Valence - electron experiences less attraction from the nucleus. This is known as the screening effect. The first to do is to write out the Electronic Configuration of Elements of the atom or the ion in the following order and grouping. (1S) (2S, 2P) (3S, 3P) (3d) (4S, 4P) (4d) (4f) (5S, 5P) etc. It may be noted that so far as the screening effect is concerned the S and P electrons belonging to the same principal quantum shell have the same effect as advocated by Slater. 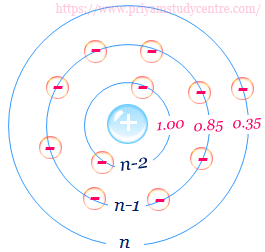 An electron in a certain (nS, nP) level is screened only by electrons in the same level and by the electrons of lower energy level.Electrons lying above (nS, nP) level do not screen any (nS, nP) electron to any extent. Higher energy electrons have no screening effect on any lower energy electrons. (1S)² (2S, 2P)⁸ (3S)¹ (The Valence electron will be excluded from our Calculation). Estimation of screening constant of the 2P electron of the Sodium atom, one 2P electron and 3S electrons will be excluded from our Calculation. Electrons of an (nS, nP) level shield a valence electrons in the same group by 0.35 each. This is also true for the electrons of the nd or nf that is for the electrons in the same group. Electrons belonging to one lower quantum shell, that is (n-1) shell shield the valence electrons by 0.85 each. Electrons belonging to (n-2) or still lower quantum shell shield the valence electron by 1.0 each. This means the screening effect is complete. The valence electron has to be left out of our estimation. The above rules are quite well for estimating the screening constant of S and P orbitals. However when a d or f electron being shielded the (iv) and (v) rule replaced by a new rules for estimation of screening constant. The replaced rules are: All electrons below the nd or nf level contribute 1.0 each towards the screening constant. We have consider only one electron of the two 4S electrons. We have consider only two electron of the three 3d electrons. In the first transition series electron filling up process begins in the 3d level below a filled 4S2 level. During ionisation process will a 4S electron or a 3d electron be lost first? Explain with reference to chromium. Hence 3d electron is more tightly held than a 4S electron. So during ionisation the 4S electron will be lost. Calculate the effective nuclear charge of the hydrogen atom. Hydrogen atom has a single 1S valence electron. There is no other electron to screen it from the nuclear charge of single proton. Thus hydrogen electron sees the full nuclear charge of the nucleus, that is the electron is totally exposed to the proton. Comment on the variation in effective nuclear charge for a 2P electron from carbon to oxygen. In carbon, 2P electron is screened by 1S2 2S2 2P1 electrons while in Nitrogen and Oxygen this is done by 1S2 2S2 2P2 and 1S2 2S2 2P3 electrons respectively. Thus Z⋆ for Nitrogen = Z⋆ for carbon + (1 nuclear charge) - Screening due to one 2P electron. Thus effective nuclear charge will go up by the same amount from carbon to Nitrogen and then to Oxygen.